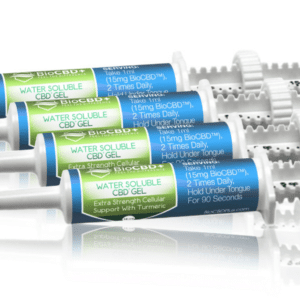 Sorry, BioCBD+: Rapid Response CBD Gel 4 pack (3,360mg CBD) has been discontinued. Bio CBD Plus chose to create high-grade CBD gels for extra-fast absorption for those who need to get CBD as quick as possible into their system. Just 0.25 ml (15mg CBD) of gel under your tongue once or twice each day is enough to give you the full benefits of CBD while also improving your overall wellness and giving you a calming, rejuvenating feeling. Help yourself with this all-natural supplement to improve your quality of life. Each package comes with FOUR 14ml tube, and each tube has 840mg of CBD for a total of 3,360mg of CBD. If you take 15mg CBD once per day, you’ll have 224 servings total. That about 7 and a half months of consistent daily use. If you take 15mg CBD twice per day, you’ll have 112 servings total. That’s about 3 and a half months of consistent daily use. 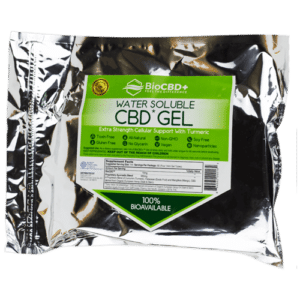 What is BioCBD+: Rapid Response CBD Gel? Fast-soothing gels are great because the blood vessels under your tongue can absorb faster than your digestive tract. CBD gels are a simple way to take a standard serving, and are often more effective than taking it in tablet or hemp oil form. CBD itself is a harmless, natural supplement that is extracted from the industrial hemp plant, which is a close cousin to medicinal marijuana. Cannabidiol, which is what CBD stands for, is actually the second-most plentiful cannabinoid found in medicinal marijuana. By taking our CBD hemp oil products, you can rest assured that what you are taking is high in CBD while containing only trace amounts of THC. 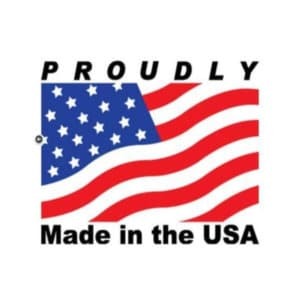 For this reason, all our products at Healthy Hemp Oil are legal in all U.S. states and in many countries worldwide. All ingredients in Bio CBD Plus’s CBD gel are natural, and there are no fillers or additives in this product. All the ingredients are easy to recognize, so you know exactly what you put into your body. Bio CBD Plus cares deeply about giving its customers all-natural supplements that will improve their life. 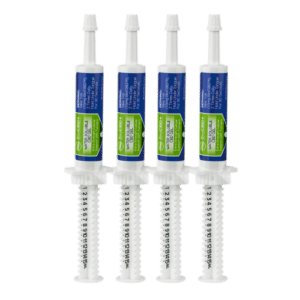 Why Choose BioCBD+: Rapid Response CBD Gel? Bio CBD Plus is one of those special brands that cares deeply about where their ingredients come from. 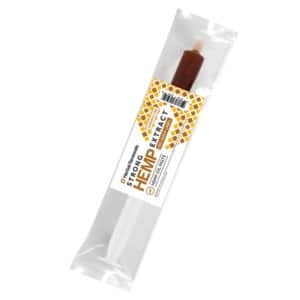 The company uses only the highest-grade oil from certified, specific farms, to ensure that each ml of CBD gel is potent in CBD and the other natural ingredients, like curcumin, mango extract, and fabaceae (an exotic fruit). CBD is a harmless substance, so you can start or stop taking it whenever you like without worry. Just remember that if you’re not used to taking CBD, it is best to start with a small serving and to stick to the recommended serving size. There are so many CBD brands and products out there that it can be difficult to find something that gives you results and real value for your money. 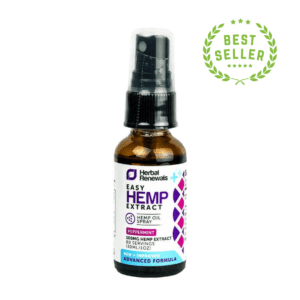 We at Healthy Hemp Oil have chosen Bio CBD Plus and our other featured brands as some of the best CBD products producers out there. We spend many hours handpicking products and deciding whether they belong in our top-quality selection. By trusting in us, you know that everything you buy is legal, safe, potent, and of high quality. All products are rigorously 3rd party lab tested before they are allowed to be sold. Start by taking a 0.25mL serving once a day to see how you feel. 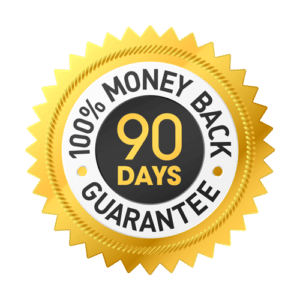 If after two weeks you aren’t seeing the benefits you would like with the Rapid Reponse CBD Gel, it’s completely safe to move up to two servings a day taken once in the morning and once in the evening – you can’t overdose off of CBD. Use only a single 0.25ml (15mg CBD) amount. Each pack shows you exactly how much you should take to reach 1ml. Dispense the 0.25ml of CBD gel directly underneath your tongue. Hold it in your mouth for about 90 seconds. This helps your body absorb some of the gel before you swallow. Some will be absorbed through the blood vessels under your tongue, while the rest will be absorbed through your digestive system after you swallow it. 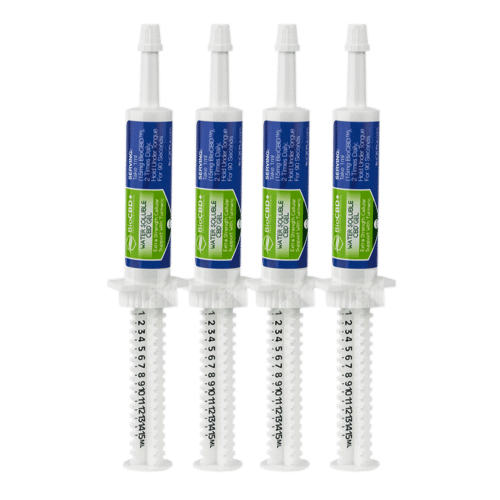 Every order contains 4 packs, which is 56 servings of CBD gel at 14mL per syringe. High-grade CBD derived from hemp, curcumin (turmeric extract), mangifera (mango extract), and fabaceae (exotic fruit extract). Warning: Store this product in a cool and dry place where pets and children can’t reach it. Pregnant or lactating women should not take CBD. If you suffer from a serious illness and/or are taking medication, talk to your GP before taking any supplements.